Love it. Good fabric and cut. Firt time I put it on a couple of linguerie models hit on me. Now I have a dozen at home and 25 girlfriends in town. 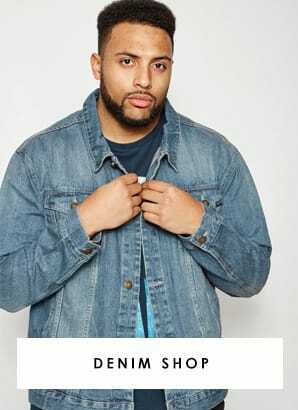 Youre the only plus size brand for men i know. You have stylish affordable clothes. Quality and variety, at good prices. Good variety, good value, helpful and happy staff. Very good range for the larger person I previously had trouble finding clothes to fit but not anymore. All sizes in tall version for good price. Often many "big and tall" clothes only go up to 2XLT. I'm currently 3XLT but have been as big as 6XL and down to XL, which is my target size. Large sizes that are in fashion, very hard to find in other store's. 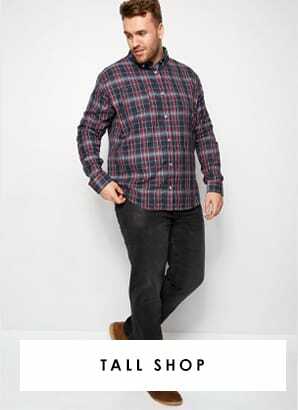 Terrific range of plus size mens clothes at reasonable prices that looks fashionable. Nice clean store with friendly staff. And the option to have items delivered to the store is great. Will definitely be going again. Sells stylish clothes unavailable on the high street. Good fit you cant get in other stores as you give the T option so good cover over the larger tummy! Not enough good quality clothes for the larger man around. Badrhino has been great and also excellent to see the clothes in store so you can get chance to see in person. Bought for my Dad as a Christmas present and he loves it. I am pleasantly surprised at the excellent quality of this polo shirt, given the price. It's really well made, the stitching is good and my Dad says it's cool and comfortable. I bought this shirt for my husband at Christmas and he loves it so much that I've had to practically force it off him to wash it!! He says he loves the softness, fit and colours. I'm going to buy him the other colour now so he actually wears something different! This is a good value polo shirt. Vibrant colour and true to size. It has washed well too. Highly recommended. Good selection of big men's clothing, swift delivery to my local yours store for easy pick up and great prices. Well please that I can get a wide fit with a long leg, great thank you. Great new brand (to me at least). Very stylish products at good prices. Bought for my husband. I thought the material was a bit thin, but my husband loves it and it keeps him warm. Very generous fit. Clothes are usually good fit and as requested, also good delivery service. My family have several tall boys - the extra long clothing is wonderful and not too expensive. I will definitely use this site again and have already recommended it to a number of people. Lovely clothing for both men and women, pity there isn't a shop in the new shopping centre in Huntingdon, need a decent men and women's clothing store here. I would recommend this size to friends and family as feel its a great site and i love it sizes are fab prices are fab lots of choise too. To any of my taller or larger friends this site would be mana from heaven, really glad I've found the place. Big size / out size / larger size clothing is, in my experience, ill fitting, cheap looking rubbish. When i find an exception i share the good news. Gave this and one in another colour to hubby for Christmas. He really liked them. Colours are vibrant. Seem to wash well. Nice length. He was always having trouble with polo shirt shrinking and then being too short. Hopefully this one will keep its length in the wash! I found the products a little "generous" in there cut but that made a pleasant change and is by no means a complaint. I now have some were I can get clothes that fit ! Bought for my very tall husband who possibly would not have chosen the pattern, but I think looks good on him. 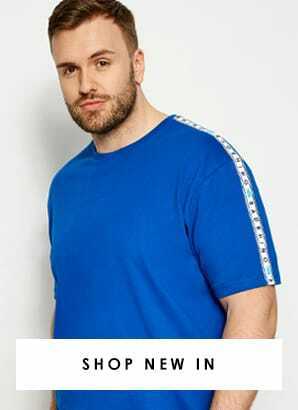 It is plenty long enough on the sleeves and the length of the body, so very pleased as not many companies cater for tall people who are also slim. Nice quality too! I would recommend to any of my tall friends who have the same problem as my husband with getting clothes to fit. I bought this as a Christmas present for a friend. He is delighted with the item. I have bought a lot of clothing from them, and all fit well and wash well. I buy the tall mans size. all have been a great fit for my Husband, wish you would open a shop where i Live. Purchased this item in 3 different colours. Bought as an xmas pressie for my son...he's 6ft 7 and they fit perfectly! I bought it for my trip to Punta Cana and it was very nice. Easy web site, not flashy models...all look normal (!). Excellent delivery. I purchased this for something a little different from the norm I like it feels good and comfortable. Good quality, reasonable prices, good fit. First of all it's nice and comfy, survived being washed a few times so far. The big standard functions of a jumper, tick. As to the pattern itself, I've had so much positive attention while wearing it, it gets you noticed for good reasons, people genuinely smile seeing it. It's a shame there's only one time of year you can wear it, because it left me feeling great. My son is 6ft 5in and struggles to get reasonably priced clothing, passed on you name to him. My son is 6ft 6in tall and struggles to find good quality clothing at reasonable prices. As already stated, tall slim females can also wear the hoodies. It would be nice to see some unisex T shirts in bright colours! Good fitting top with a collar that suits. Lovely quality. If your on the large size tall or portly it has everything you need in one shop. Great to have an online/in store shop that recognises not everyone has a 34" leg length and stop at size 12 shoe. Good to see items for tall and large men instore and be able to check the quality. My son is 6ft 5 tall, recommended Bad Rhino when I last spoke with him. Fantastic product and service. I don't usually fo reviews but this was well deserved. Excellent service. Fast and efficient dispatch and delivery. Very accurate description of items purchased. Thank-you. It's a great site with great prices. Good bargains in the sale range. Good fit, good quality and seamless transaction/ All in all good stuff and I will be back. The quality of the product. It’s legit. Thank you for caring about your customers. Great and prompt service along with an amazing choice and range , most of all proving to be of very good quality . Sent to my son in Tasmania as a birthday gift he loves it. Good quality and sizings plus value for money. Good service. Good quality. Good price. Please stay this way. Good quality plus size clothing at a reasonable price. Good value. Good quality. Good sizing. You tell us what actual sizes are ie, 4XL is... 5XL is........etc. great fitand comfortable to wear. First order from you and was really pleased with everything. I like the products, especially the shirts which fit just right. Prices are reasonable and I’ve had no problems with delivery. Now there’s a shop on the high street too, so I can return items there if I need to. Buying without seeing is sometimes disappointing. These sweatshirts are exactly as described. Excellent buy. It's one of the best sites ever. Easy to order on-line, returns via Asda are easy too. They had the plus size man in mind when constructing these jeans! I love them so much. I m very happy with badrhino good quality reasonable prices perfect sizes. Women have for a long time been able to select and purchase outsize clothing and at last Badrhino has redressed the balance to include men…….well done. At long last a retailer which sells clothing of decent quality and decent prices for extra tall guys. I wish you every success. Good product. Good value. Quick delivery. Would do business with again. Thank you! I purchased this one and the blue both are excellent and great ordering experience and for once Hermes delivered without a problem as we all know what Hermes can be like or maybe that just my companies experience with them lol thanks all at Badrhino/Yours for your excellent customer experience flawless. Quality and price plus convenience local stores and knocks the competition out the water well done finally feel like I am being treated like a normal person and can shop in malls with my wife. Good range of quality products for the larger man. I think it is helpful for others to know places that offer stylish, affordable clothing to fit extended sizes. It should not be a secret, to know that there are other options in the world. Never been let down. Prices are OK as well. These are the best t-shirts on the market. - lovely and long for a larger person.Thick material - so not aee through. I keep trying other makes and always come back to these. Good quality clothing at a reasonable price, at last a company supplying larger size clothing that is excellent value! 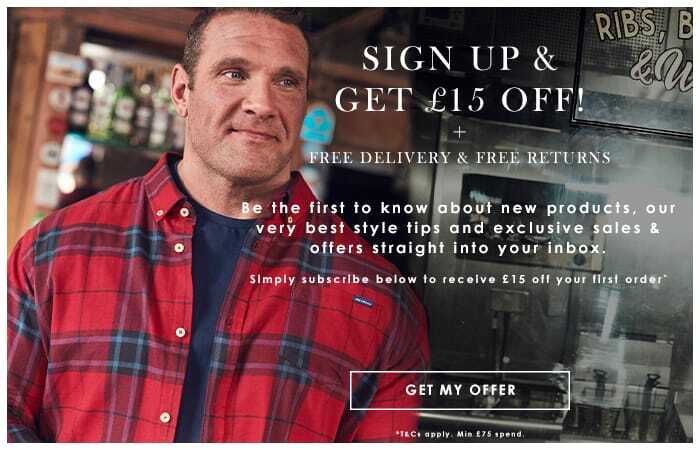 Excellent menswear product good value for money..
Nice range of clothing for us extra large guys. Very efficient parcel and post and it arrives in regional Australia in very good time. They always have been a very reliable company and I buy all my t shirts and grand dadstyle shirts from them. i would like more colours in the grand Dad style but otherwise a great company. Good value, service, clear information including pictures. Because the items that I have bought from BadRhino have been good value, long lasting and in sizes you can't find in most high street stores. Fashionable styles and good quality for the larger man! Great value great products and service! 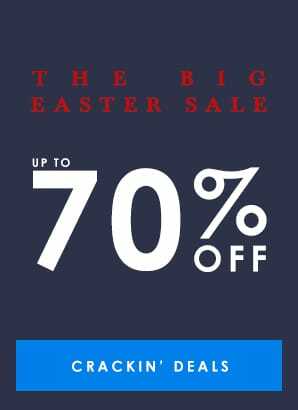 There aren't many sites like this for outsize menswear and Badrhino fills the clothing market perfectly…. Good stuff at good prices especially for people who are not "normal" fit. I needed a short sleeved shirt and this came up on the Bad Rhino website. Ordered it to collect in store, all good especially the wonderful customer service from the shop staff. Very happy with the quality of the shirt and the friendly manner in which I was dealt with. Thumbs up! Its good to shop i get most of useful shopping from badrhino. Really good company to deal with.Excellent service. Good service,lovely range of clothing. Lovely belt, just what i was looking for :) Finally a belt I can wear! Brilliant products and good service/delivery. These jeans fit just right which ain't easy on this 5'7 255 lb frame. Kudos! Wish there were more color options. Good quality items and real value for money. First time I have shopped here but will definitely be back. Good choice, good prices. Bought two for my husband, excellent quality & value. Good quality and great fit. I'm tall so they are nice and long. your clothes are well made and not too costly, you also do sizes that fit two men, one at 6ft4 and 50 inch chest and the other at 6ft8 with a 52inch chest. There's something for every one and every occasion, my hasband and I both needed clothing for has Dads funeral. I was able to get most bits in the shop and his shirt was ordered and arrived the very next day . All the reasons stated above. Hubby always complains there's never many large sizes in men's clothes, until I told him about badrhino. I gave it to him to have a look through and he found a pair of swim shorts and took a chance on ordering them, I convinced him to try them as I'm always happy with my clothing from yours. When they arrived he tried them on and was so pleased with the quality and fit, that he said "" would you mind ordering me the light blue ones as well ! "" see, I said you should listen to your wife more often"" ! He will definitely be a very happy bad rhino customer from now on ! Excellent fit, clearly good quality material. Often with clothes this size, I find the material and general shape are poor, but not the case here. Very nice! Bought for husband for holiday. It is quite a think fabric, but very soft and a really nice colour. He said he will wear it more when the weather gets cooler as it is quite cosy! The 3XL fits his perfectly. I bought this for my son and he veryvpleased with it. He is tall over 6 ft and sometimes finds shirts too short but this is great. Washes wrll too. Bought this for my hubby. He was having trouble finding t-shirts of a decent length, as his stomach has "expanded" slightly with age! This t-shirt is a perfect fit and long enough so that it doesn't "ride up"
Very good quality product, I will definitely buy again. Happy with the prices and the fit, would like to see more choices on shorts though. Always bought BR jeans - wear them all the time fit and quality both great. great product, great value for money. Hard to find such nice big and tall options. I've been getting a lot of compliments about the stripes since I bought this. Really nice material - feels well made - would definitely recommend! For all the reasons that I explained above - excellent products. I love the clothes and would recommend them, but shipping fees to Sweden are a bit high. Bought for holiday and fit really well. Great fit. Bought this for my husband for holiday, as I didn't want his expensive designer tshirts getting ruined with sun creams. Was surprised at how good the quality is and how well this washes, better than some other tshirts that cost twice as much! I will be buying him more from this brand. Got them for my husband and he loves them. Says they are very comfy! Second time i have bought this polo as it is a great vibrant colour in a quality cotton in a good generous fit. These tops feel and fit like they should be costing twice as much. They even wash well and still feel brand new after several washes. The fit is spot on too unlike several other brands i have tried. Quality of service and clothes are second to none. Quality product & good service! I trust the items, delivery and pricing. Because i am obese have to buy big, tried many companies but these are excellent clothing, great size great material. Nice clothes at decent prices. Delighted with this and good to see a company with big sizes available. Well done ! Good service from badrhino, collected in Yours shop in 24 hours after placing order. You have saved my sewing life! Oh and the products are really good. A smiler: he's already spilled bleach on 3 new T Shirts so I'll be back ordering again!!!! Know any cure for bleach stains??? I love the range of products and the big sizes. Perfect fit just like the other sweatshirts - please make more, great quality and easy washable. Good value for price point. Perfect fit, comfort and quality. I will be buying more from Bad Rhino in the future. More buy your product the longer you stay in business and I can be sure of a continuing supply of decent kit! My first time of using BadRhino. Good value and quick delivery. Just what's required of an on-line purchase. Will check them first next time I require clothing. Excellent quality, size, material. Ordered big for comfort. Clothes for real sized people. Great Staff. Good quality items that arrive when they should. Shame you can't do Collect + for click and collect as not too many stores down this end of the country. However I'm always pleased with the garments I have ordered and so far have not had to return anything. Good job BAD RHINO. I have found that all items I have purchased either for my son or husband have been of good quality, as described & true to size.